To begin the festivities on Saturday, July 4, the Recreation Department will hold its annual field day for youngsters, ages 4 - 12 at the Municipal Stadium starting promptly at 9:30 a.m. The events, which will be open to all young Belleville residents, will be divided into three categories. There is a Junior division for ages 4 - 6; An Intermediate division for ages 7 - 9; and a Senior division for ages 10 - 12. Events will include the 25, 50 and 100 yard dash, an agility race, a three-legged race, sack race, a girl’s tug-of-war and a boy’s tug-of-war. All activities will be conducted by the members of the Belleville Recreation playground staff. Ribbons will be awarded to the first, second and third-place finishers and all will share in slices of watermelon. On Saturday night, July 4, a fireworks display will be presented at the Stadium starting at sundown (approximately 9:15 p.m). The rain date for these events will be Sunday, July 5. MAGIC SHOW – featuring Joe Fischer8:00 p.m. Sand Art and Spin Art will also be offered for a nominal fee, as well as Refreshments/ concessionaires. In all, it promises to be an exciting holiday and Bellevillites young and old are invited to share in the glitter of our country’s historic day. Florham Park has been throwing a party for the 4th of July for 52 years and it seems that they didn’t let the economy slow them down this year. The rain date for the Florham Park Fireworks is Sunday, July 5, 2009. STARTING WITH THURSDAY, JULY 2NDAn evening of music with the Paramus community OrchestraDirector- Judy Wilkes"An American Tradition"Patriotic and Pop selectionsCome to the Bandshell at the Library at 7:30 P.M. at 116 Century Road. SUNDAY, JULY 5THBlock Party - At the Sports Complex right next to Westfield Shopping Center in Paramus.5:00 P.M. to DuskA wide variety of food booths, drinks, snacks, free rides for the kids, entertainment & more! Bring the whole family! There will be music at 7:00 P.M. followed by our great fireworks display! The Ridgefield Park Fourth of July Parade and Celebration, founded in 1894 is one of the oldest parades in the United States, and the oldest in New Jersey. Freedom Fair is a carnival that features rides, games, crafts and food. Visitors can ride all the rides as many times as they want for $20.00. The fair is open from 7:00 to 11:00 PM. Parade Day,The parade starts at Dover-Chester Road and Randolph Avenue at the Mt. Fern Church and ends at the County College of Morris [CCM]. The parade includes bands, pipe and drum cores, floats, local dignitaries, antique cars and riders on horseback. Freedom Fair is a carnival that features rides, games, crafts and food. The carnival and fair is open from 2:00 to 11:00 PM. Freedom Fair is a carnival that features rides, games, crafts and food. The carnival and fair is open from 2:00 to 11:00 PM. This is the last day of the fair. The Freedom Festival Fireworks Display begins at 9:45 and the promoters call it the best show in Morris County [and it does have quite a few competitors for that title] The event features paid parking which helps defer the cost of the fireworks. Parking is plentiful and inexpensive. The cost is $5.00 per car and the first 500 visitors will receive an eco-friendly shopping bag. [limit 1 per car] The rain date for the Randolph fireworks display is Sunday, July 5, 2009. This annual Fourth of July tradition is a free, family oriented festival, which attracts both local residents and visitors from throughout the region. The event takes place along a half mile stretch of the oceanfront promenade between Seven Presidents Park and the Ocean Place Resort and Spa. Activities will include master sand sculpting exhibits on the beach, strolling entertainers, live music of every imaginable type, food vendors, craft vendors and lots of activities for children. The fun-filled daytime activities offer a great prelude to a spectacular fireworks display. NJSO IN THE PARKS — FREE CONCERTS! Pack a picnic, gather friends and family, and enjoy the NJSO's annual summer outdoor concert series! You'll hear selections from West Side Story, Carmen, Don Giovanni and The Mikado, patriotic favorites including the "Armed Forces Salute" and "America the Beautiful," and much, much more. Fun for all ages! BRIDGEWATER -- Families from across Somerset County will celebrate the Fourth of July at Somerset County's biggest party, the 39th annual Independence Day Family Festival. The festival begins at 5 p.m. Saturday, July 4 at North Branch Park on Milltown Road. There is no charge to attend. July 4, Sat. New York City NY USA "Macy's 4th of July" Fireworks. Hudson River between 24th and 50th Streets, 9p. ("Macy’s 4th of July Fireworks® pyrotechnic splendor returns to the Hudson River for the first time since 2000 to celebrate America’s birthday with the nation’s largest 4th of July fireworks display. On Saturday, July 4, at 9:00 PM, Macy’s will create a showstopper like no other to honor the country’s independence and to kick off the 400th anniversary of the exploration of the Hudson River by Henry Hudson. The patriotic revelry will feature approximately 40,000 shells exploding in a kaleidoscope of color at a rate of more than 1,500 per minute. The 26-minute display, designed in collaboration with SOUSA Fireworks, will be set off from six barges positioned between 24th and 50th Streets on the Hudson River giving New York City residents a stunning front row seat to America’s biggest Independence Day party. A great Family Event! Join us as we celebrate our nation’s 233rd birthday by reenacting a traditional reading of the declaration of independence. Reenactors help to create a lively 18th century town atmosphere. Activities include: Colonial Games, Colonial Crafters, drilling with the Militia, Sign your own Declaration of Independence, Revolutionary War map making, Colonial Dancing, and blacksmith shop demonstrations. Event begins at 1:00pm; Declaration of Independence is Read at 2:30pm. Historic House tours will be available in the morning. Free watermelon for visitors! No cost for event, $5 per car parking fee to enter park. Sponsored by the North Jersey Highlands Historical Society and Ringwood State Park. 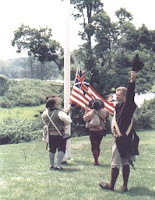 Participants in this year’s event include: NJ Militia – Heard’s Brigade, The Department of the Geographer to the Army, Friends of Long Pond Ironworks, the 5th NJ Regiment, the 35th Regimental Society, the North River Colonial English Dancers, and various individual reenactors and volunteers. State Fair Meadowlands at Giants Stadium Fairgrounds will run daily from June 25 - July 12. Kick off this summer with New Jersey's Most Gi-Normous, family-friendly event, featuring plenty of free nightly entertainment with dazzling performers, delicious food, over 150 rides and attractions, bargain ticket nights, live concerts and spectacular fireworks on July 3 & 4. Enjoy recession-busting bargains for the entire family close to home at State Fair Meadowlands. Parking is only $3! Log on to njfair.com for information, discounts and live concert line-up.